It’s not exactly an inconvenient truth, the unpredictability of Toronto’s weather. Still, it’s been a good number of years since spring started so strange. As much as we’d prefer to plan for the changing of the seasons, it’s hard to know just when the sweet spots will hit. If you’ve got a little bit of the wearing-shorts-way-too-early in you, here are some semi-spontaneous ideas to get you outside on a spur of the moment’s notice. There are few better indicators of the beginning of spring than the beginning of the baseball season, even if hockey playoffs continue well into June. 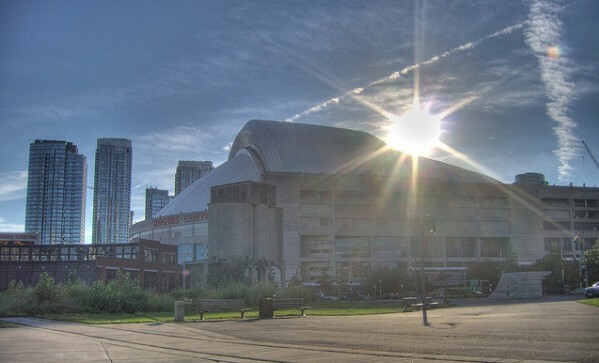 The Jays’ home opener takes place this Friday, April 1, and if the weather co-operates the Roger Centre’s roof just might be open. Though the game is sold out, there’s sure to be the typical glut of scalpers lingering outside the Dome (not that we condone that type of thing). If you’re less of a haggler, Toronto FC’s second home game takes place Saturday at BMO Field, and it’ll definitely be played in open air. Kensington Market is a ghost town in the winter months, but the colourful neighbourhood becomes a pedestrian’s paradise at the first glimpse of warm weather. The market is home to discount clothes shopping (Tom’s Place is always a good bet for a cheap suit) and off-kilter people-watching. There’s street food a-plenty, too, with Patty King and Jumbo Empanadas offering options mobile enough to accompany you on your stroll. For all its galleries, restaurants and bars, the Distillery District remains one of the city’s most overlooked neighbourhood gems. Something you probably don’t know: The district is home to Toronto’s only official Segway dealer, and it’s one of the only places in the city you can take one of the motorized gliders for a spin. It’s pricey ($39 for a half hour), but it’s a good, if strange, way to enjoy the weather and the scenery. Unless your swing resembles Happy Gilmour’s, there are few things more relaxing on a spring day than hitting a few golf balls. All it takes is a cold draft to throw off your form, but Polson Pier’s heated posts allow you to grab a bucket without freezing your proverbial balls off. 11 Polson Street, 416-469-5655. Nothing goes together quite like beer and sunshine. We don’t know why, it just does. The Black Bull and Café Diplomatico tend to get perennial ”best of” nods, but for our money the best downtown patio in Toronto belongs to the Victory Café. There’s often a long queue for a coveted outdoor table in the summer months, so heading there early might be your only chance to grab one without a wait. Just bring a sweater. 581 Markham Street, Toronto, 416-516-5787.